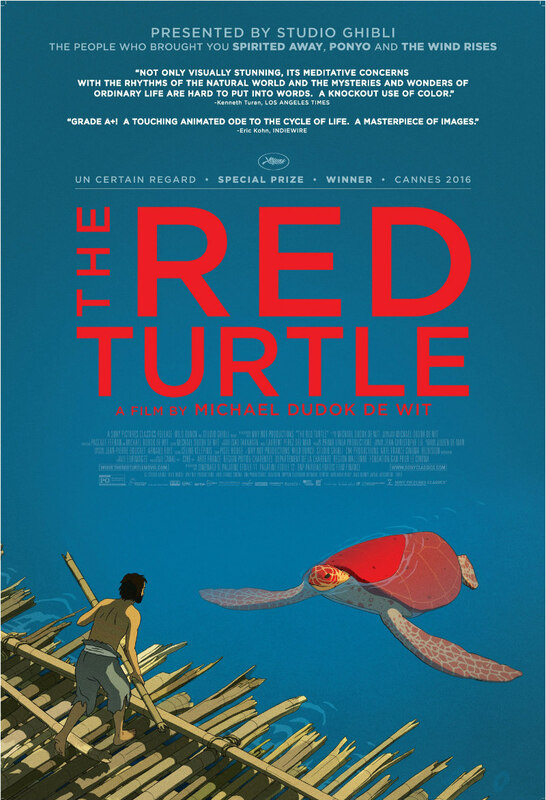 A castaway has a life-altering encounter with a giant red turtle. It's rare to find a truly cinematic movie today. That is, one that relies solely on visuals to tell its story without the aid of dialogue or voiceover narration. The Oscar winning The Artist may have technically been a 'silent' movie, but it still employed title cards on occasion. 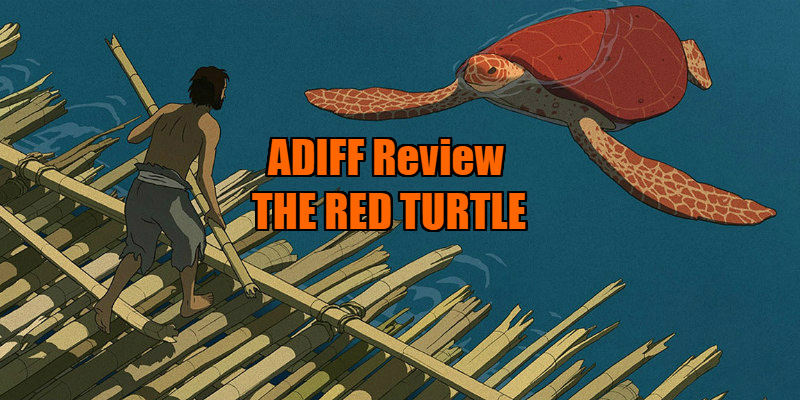 Like JC Chandor's All Is Lost, Michael Dudok de Wit's animated fable, The Red Turtle, is the real deal, with no more than the occasional grunt of frustration emanating from the throat of its protagonist. As with All Is Lost, The Red Turtle opens with trouble at sea, as a man is washed ashore on a remote and deserted island. Using bamboo from the nearby forest, he constructs a raft and sets out to sea, but he doesn't get too far before his makeshift vessel is smashed to splinters by some unseen force. Starting from scratch, the man builds a new raft, only to suffer the same fate once he hits the water. When a third raft is similarly shattered, the man discovers the culprit, a giant red turtle. Later, the turtle makes its way onto land, and in a fit of rage the man beats it over the head with a stick of bamboo and turns it on its back. Suffering from guilt for his actions, the man attempts in vain to revive the dead turtle, but can't even summon the strength to turn the creature on its belly. I'll refrain from going into details, but it's at this point that the film becomes something of a fantasy, and I have to confess it lost me to a degree from this point on. The early sequences, in which the unnamed man adjusts to his new environment, are fascinating, and the film explores our conflicted relationship with nature in enthralling fashion. The movie's second half failed to grip me to such a degree, and I found its fable-like storytelling far less compelling. The animation here may appear quaint to a generation raised on Pixar, but the compositions are simply beautiful, with vast shots expressing the dichotomy of the man's dire situation and the enchanting nature of the location he's unwittingly found himself in. De Wit's choice of shots and the restrained editing reflect the psychology of the lone protagonist, trapped on a speck in the ocean with a lifetime to fill. Sound plays a huge part here too, with the imagined noises of civilisation taunting the man's increasingly disturbed mind. The Red Turtle is at times a thing of beauty, but it also frustrates for a considerable portion of its running time. Ultimately it falls short of a great animated feature, but it's worth seeing for its mesmerising first half, which taken on its own merits is undoubtedly a great animated short. The Red Turtle played at the Audi Dublin International Film Festival. It opens in UK cinemas May 26th.